At high doses, e.g. : 100 or 200 mg twice a day, doxycycline, a form of Tetracycline, acts as an antibiotic and anti-inflammatory. In lower doses, 20mg or 40mg daily, sometimes prescribed to patients with Rosacea or blepharitis, doxycycline acts primarily as an anti-inflammatory. The anti-inflammatory properties are particularly important for healthy meibomian gland secretions. 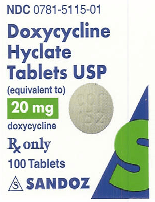 At low doses, it is best to take doxycycline on an empty stomach, at least two hours after, and one hour before, a meal. This ensures absorption and prevents calcium consumption, which interferes with absorption. Follow dosing instructions. Whenever oral antibiotics are taken, and particularly if they are taken long term, it is important to support gut health with good probiotics. Some doctors may prescribe Minocycline, a different form of Tetarcycline, with different risk factors. Sobolewska B, Doycheva D, Deuter C, Pfeffer I, Schaller M, Zierhut M.